Where do our computers live? 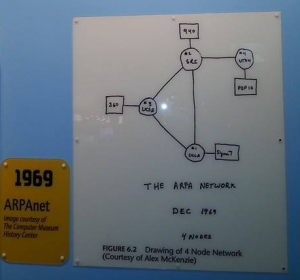 We tend to live in places that provide some comfort to our psyche for various reasons - but when we plug into the cyberworld - what does THAT neighborhood look like? How comfortable should you be when connected to the Internet? 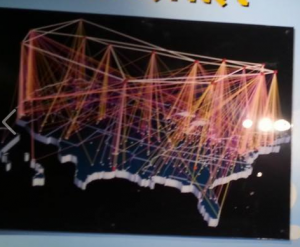 I am trying to visually represent the "lay of the land" when you connect to the Internet. 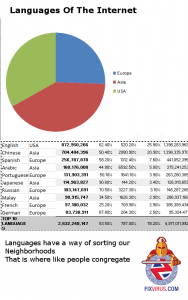 I could list all of the Countries, but I will stick to a list of languages that are on the Internet from Internetworldstats.com¹. How do we decide on the neighborhoods on the worldwide Internet? it must be by languages. The reason I have chosen to segregate the Internet neighborhoods is that as human Internet users we are creatures of comfort and ease of use. Why would an English speaker go to a Chinese site? If they did it would be for a specific reason. Not sure if many other Chinese sites would be frequented. You can see that languages can be a valid form of segmentation. I placed all English(873mil) in USA region because the Internet originated in the US and that has a weight of it s own. Europe(673mil) consists of Spanish(257mil), Russian(103mil), French(97mil), Portuguese(132mil), and German(84mil). Of course, Brazil has Portuguese and could be placed in America as well. Mexico is Spanish as well as many South American nations which also could be placed in America. But I wanted to not overweight the USA as it received several million from England and Australia as it is. This is representation is not perfect as many countries and languages may have multiple languages, But if that was the case like in Universities, the USA would just siphon more from everywhere due to its initial setup and momentum. A very large country just beginning to fully connect is India which has English as primary language but also has Hindu and other regional dialects. The other item I left off is Africa, as it consists of many European languages, the African native languages are very few in number. To keep things simple I kept only the top10 languages and made some decisions for now. 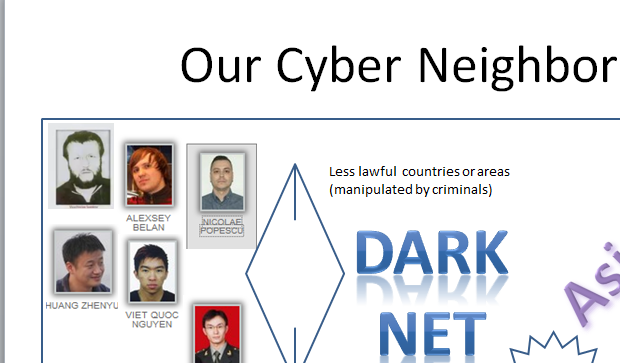 So even imperfectly we can figure out the Cyber neighborhoods. Why perform this exercise? Because we need to know the lay of the land to figure out our risk. The big attack angle are all the US companies in English as they can be attacked by Eastern Europe and Asia and any other light in law area. Why is that an attack angle? Because the English websites are at least 26% of all sites, with a likely number higher (since the Internet was developed in the English speaking countries first gave them a leg up on the number of websites, as well as using old software. 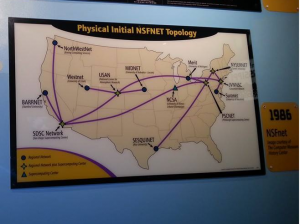 Notice the picture above shows the Internet and how it grew by 1991You can see the NAP's (Network Access Points in the major data centers at east and west coast, as well as Chicago, Denver, and Texas. US businesses seem to be obsessed with running their businesses instead of spending a little bit of time on cybersecurity. 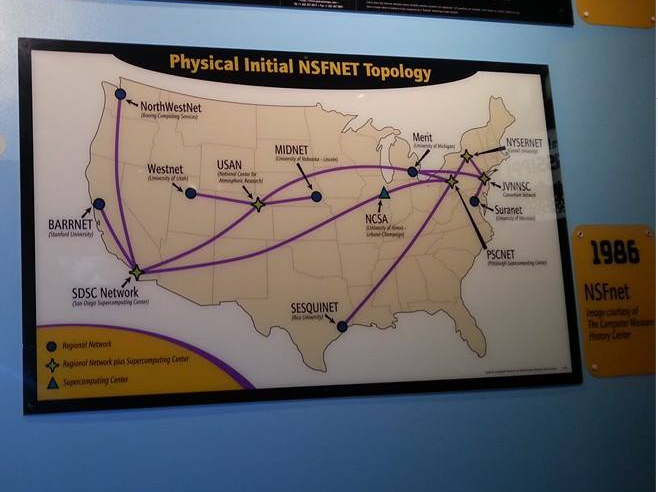 In either case the major cyber breaches have overwhelmingly been based in the US for whatever reason. This fact of life does not mean you spend 50% of revenue on Cyber security, but maybe you need to spend a _little_ more than you have been with risk analysis and disaster recovery plans and more.